Thanksgiving lunch/dinner (linner) is traditionally served at 4:00PM at our house. This gives everyone the chance to eat and drink as much as they want and still not get home too stuffed or too late. Our Linner usually lasts for 5 to 6 hours. This year was no exception. To start, Michele made persimmons wedges wrapped in prosciutto, followed by a chestnut soup, roast turkey with a fennel, sausage and rice stuffing and many side dishes. Then we had a cheese course, followed by a hazelnut tar and caramel pumpkin pie for dessert. 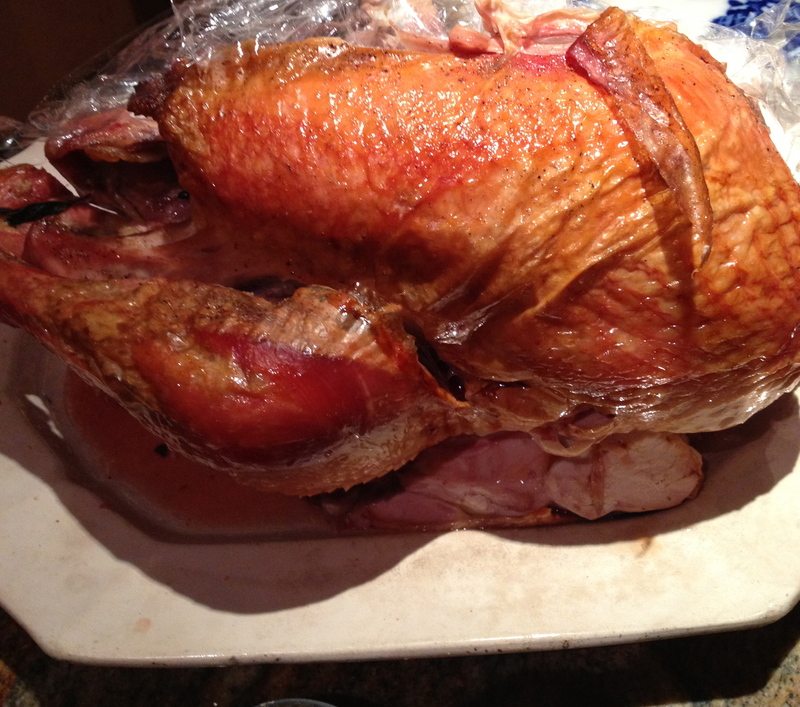 We have been having Thanksgiving for several years with Tom Maresca http://ubriaco.wordpress.com and his wife Diane Darrow http://dianescookbooks.wordpress.com. Diane is a very excellent baker and brought a beautiful loaf of home made bread, as well as the hazelnut tart mentioned above. Travis and Nicole joined us this year and brought some Champagne and old wines. 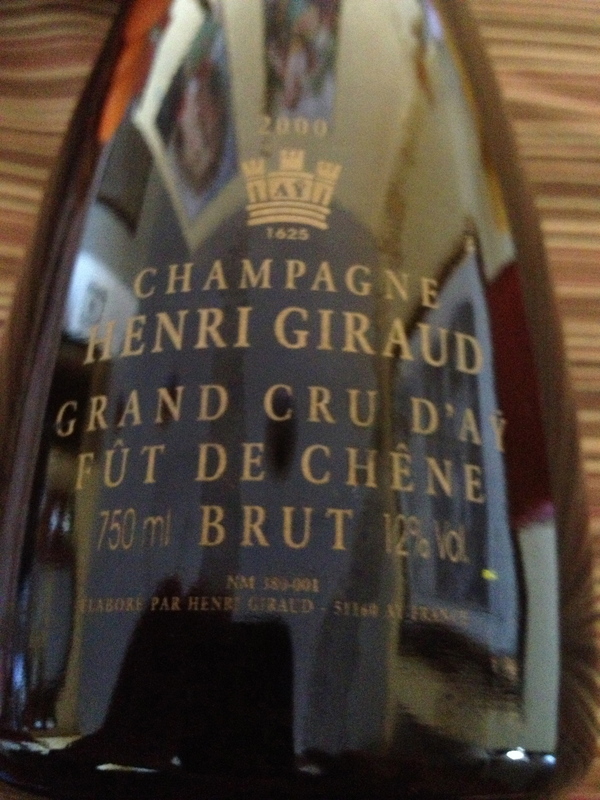 The Wines Champagne Grand Cru D’ay Füt de Chène Brut 2000 Henri Giraud. 70% Pinot Noir and 30% Chardonnay harvested exclusively in the terroir of Aÿ Grand Cru. The wine is aged in small barrels made from Argonne oak for 12 months. The first vintage was in 1990. This is a full and rich wine with aromas of pear, stone fruits and a hint of mushrooms. It has a long lasting finish. 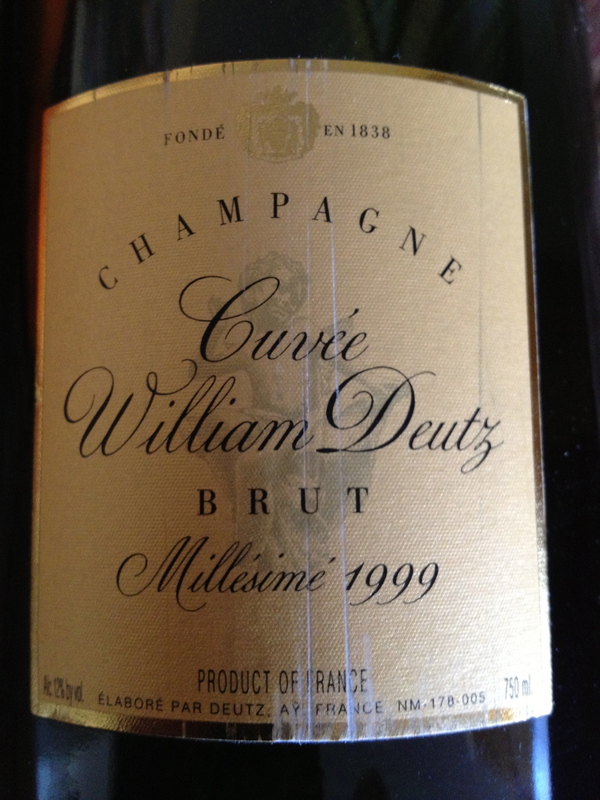 Champagne Curvèe William Durtz Brut Millesimè (prestige cuvee) 1999 (Aÿ) made from 62% Pinot Noir, 30% Chardonnay and 8% Pinot Meunier. This is a well-structured, complex, elegant Champagne with hints of herbs, dried flowers and a touch of toast. 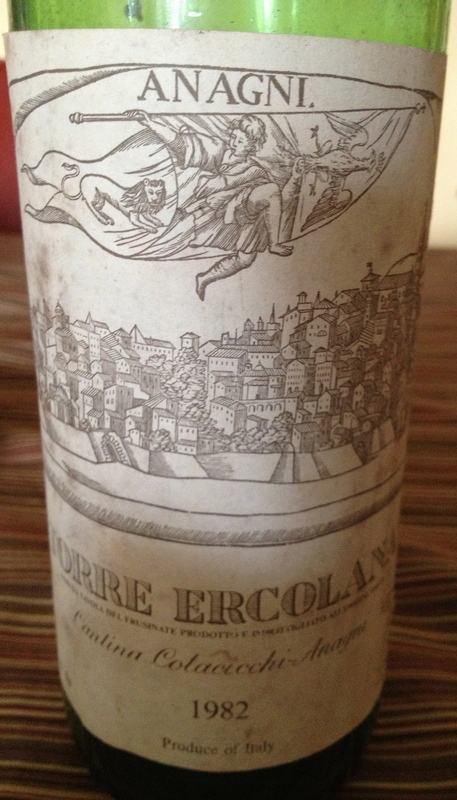 Torre Ercolana 1982 Cantina Colacicchi – Anagni Cabernet Sauvignon, Merlot and Cesanese dl Piglio When this wine was produced, there were only 2 acres of vines and only 2,000 bottles were made, one fourth of them a white called Romagnano. The wine is made by a natural fermentation, no filtration, sterilization or pasteurization. The wine is aged in barrel with four rackings a year. I have been drinking the older vintage of this wine for a number of years and buy them in Rome at Trimani, who has the exclusive rights to the wine. The wine does not always taste the same; this is because the blend changes according to the vintage. In hot vintages the Cesanese does better so there is more of it in the blend. In cooler vintages the Cabernet Sauvignon and Merlot does better so their percentage is increased. The best however is when all three varieties ripen perfectly. Burton Anderson in his book VINO describes the wine in musical terms. 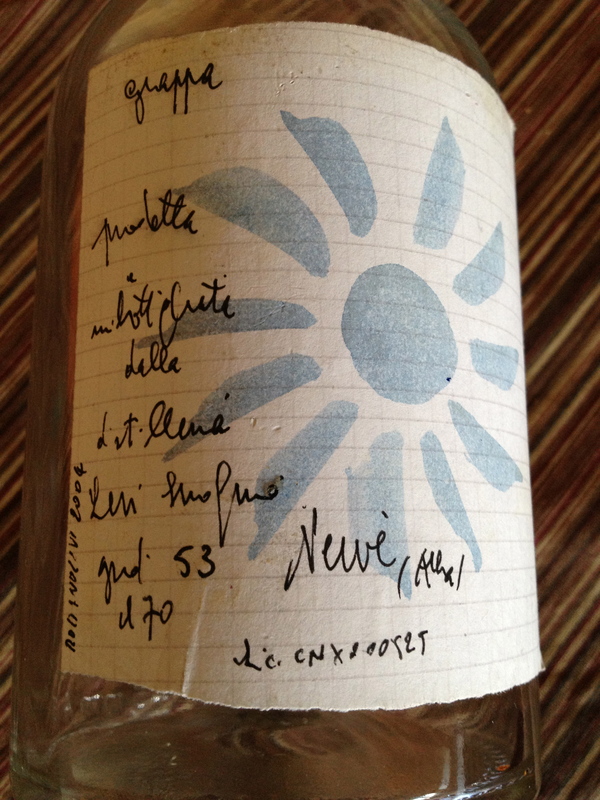 “My first mouthful of Torre Ercolana was like my first earful of Beethoven’s Fifth: so overpowering it left me gasping for adjectives to describe it.” Morey-Saint-Denis “Les Sorbets” 1976 Domine B. Serveau et Fils. Made from 100% Pinot Noir. The soil is limestone and clay and the 7 hectares of Pinot Noir are in the heart of the Côte de Nuits. The grapes are picked by hand and the wine is matured in oak casks for 18/22 months. The Premiers Crus are aged 2/10 years before coming to market. This is a wonderful wine with aromas of red fruit and blackberries, round with a silky fruity feeling on the palate. It was a pleasure to drink. Reciotto Secco “Amarone” Vino della Valpolicella 1960. Bertani. This is one of my favorite producers and I like Amarone on Thanksgiving. With turkey and all the side dishes, it makes for a great combination. So I was very disappointed because the wine was too old and tasted like sherry. Travis brought the wine. He had had a 1964 a few days before and said it was wonderful. You never know with old wines — you take your chances and hope for the best. 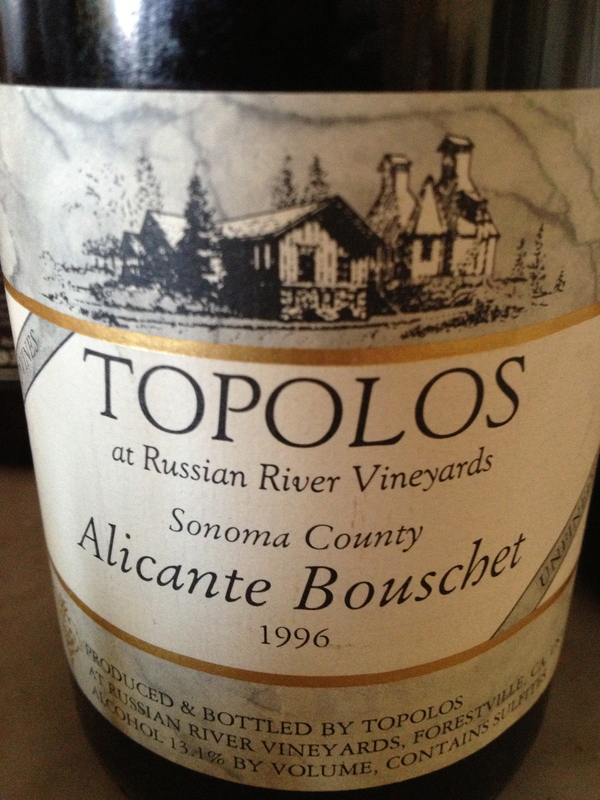 Alicante Bouschet 1996 Russian River Vineyards (old vines), Sonoma Country Topolos, made from 100% Alicante Bouschet from the Sequoia View Vineyards. The wine is unrefined. It was bottled December 16, 1997. Since the Amarone was not good and it was Thanksgiving, the truly all-American holiday, I decided to try this wine. It was interesting but it seemed they were trying to make an old style wine but could not get away from all the modern techniques. It was unbalanced with too much alcohol. The winery was sold and the name changed to Russian River Vineyards and I do not know if they still produce this wine. Because we had a cheese course and two pies, it was time for the dessert wines. Montefalco Sagrantino D’Arquata Passito Abboccato DOC 1981 Adanti 100% Sagrantino The grapes are naturally dried for two months (appassimento) followed by a slow fermentation. The wine is aged in large Slovenian oak barrels (botti). They still make a passito but the word Abboccato does not appear on the label. The wine had aromas and flavors of dry fruit, blackberries and a dry aftertaste. 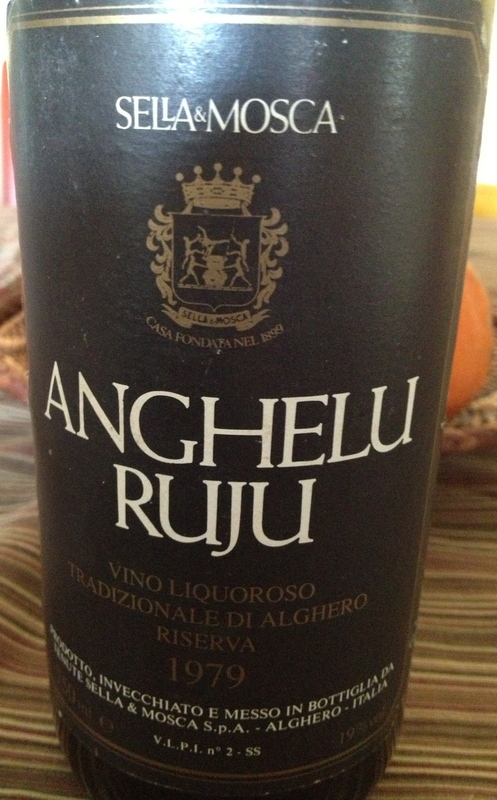 Anghelu Ruju 1979 Vino Liquoroso Tradizional di Alghero Sella & Mosca (Sardinia) 100% Cannonau. This is a late harvest and after the grapes are picked they are dried in the open air for a long time. There is a long oak aging in fusti (small oak barrels of 20/50 liters). This is an aromatic wine with hints of cinnamon and walnuts. I do not think it was produced after the 2003 vintage. We ended the meal with the last of my last bottle of Romano Levi Grappa, which I bought a few years ago just before the great grappa maker died.